As you’ve heard from previous communications, Homes and ADI Global Distribution will be spinning off from Honeywell to become an independent company. We expect the spin to be completed by the end of 2018. Many of you have been wondering how we’ll continue to deliver on the heritage and reliability of a great brand like Honeywell and have asked what will the brand become after the spin. 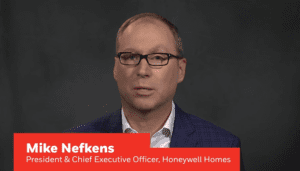 In this letter, I’m excited to share with you the new corporate name of the Homes business, how we will go to market using the Honeywell name and a little background on the development of the name. In a global town hall with our employees today, I shared that our new company will be named Resideo. You can learn more at resideo.com, which includes a video about the name but first let me give you some of the concepts behind the name. Together, these bring about thoughts of safety, comfort, security, strength, reliability and trust – in a combined word that expresses our identity as a technology company. These are timeless messages that are core to the Resideo business, as they express our focus on the home and our commitment to keeping the users of our products safe and secure. I’m also excited to announce that while Resideo will be our corporate name, known by our employees and shareholders, for you, our key customers, we have also put together a long-term licensing agreement with Honeywell for use of the Honeywell brand. So, the products that our customers have known and loved for more than 100 years, and around which many of you have built your businesses, will be around for a long time to come. I look forward to working together and I am excited about our endless possibilities for shared success. The spinoff is subject to customary conditions and regulatory approvals, including final approval by Honeywell’s board of directors. This communication shall not constitute an offer of any securities for sale, nor shall there be any offer, sale or distribution of securities in any jurisdiction in which such offer, sale or distribution would be unlawful prior to appropriate registration or qualification under the securities laws of such jurisdiction.